Runner Up: Kal Cam's Go Girl "Suzie"
Winner: Dry Creek Pappomatic "Pappy"
Runner Up: Onpoint's Spinning Axel "Axel"
Runner Up: Saginaw Diamond Dan "Danny"
2nd Runner Up: Kal-Cam's Runnin Dozer "Dozer"
The National Vizsla Association held its 12th annual National Championship on The Sportsmen’s Association grounds near Grovespring, MO, March 20th through 24th. These grounds have been the home of this event since 2001. This fine venue is the site of several championships each year, including the Missouri Open All Age Championship which follows this trial. The National Vizsla Association events began with the 10th Running of its National Amateur Championship followed by the National Derby Classic and concluded with the National Championship. Monday brought light snow, blowing rain and temperatures in the thirties for the commencement of the National Amateur Championship. With twenty two entries from around the country as well as Canada, handlers, judges and dogs were prepared to deal with the inclement weather and the trial was off by 8:20 am. Bird work was a bit scarce on Monday, probably due to the weather having the birds buried up in heavy cover. Tuesday’s weather wasn’t much better but the birds were out feeding and a few more finds were carded. These conditions were ideal for such a Championship as it tested the dog’s abilities and desire to find game. HAWK’S PAPPOMATIC was victorious for his owner and handler Dustin Ochs of Emporia, KS. With ONPOINT’S SPINNING AXEL being named Runner-Up for his owner William Thompson of Ontario, Canada and adeptly handled by Barry Bassingthwaite. Pappy is not unfamiliar with the winner’s circle, having won this same event in 2005 and also being named runner-up in the Open Championship in 2005. This was Axel’s first visit to the winner’s stand but you can look for him to show up again in the future. The judges for this event, Mark Johnson of Winnebago, IL and Doug Reisner of Black River Falls, WI rode out the weather with constant attention to the performance of all contenders and their decisions were well received. The National Derby Classic ran on Wednesday, March 22nd and was greeted by clearing skies and temperatures in the 40’s. A contention of 22 young dogs were also entered in this event. STRIDER’S GENERATOR was named winner for owner’s Michel Berner of Dousman, WI and Robert Tomczak of Elk Mound, WI and was handled by Tomczak. SAGINAW DIAMOND DAN garnered the runner-up title for owner, handler Mark Johnson of Winnebago, IL. Third place went toKAL-CAM’S’S RUNNIN DOZER, handled by Daniel Burjan for owner Brian Kennedy of Pequea PA. Judges, Mike Kindler of Brownsville, WI and Ned Myers from Mt. Vernon, IA had the pleasure of watching several nice young prospects from which to choose these winners. Thursday and Friday brought cool, sunny weather for the running of the National Championship with ONPOINTS TUFF STUFF emerging victorious from the 22 entries. She is owned by John & Debbie Reid of Ontario Canada and handled by John. Tuffy, having won this event in 2002, showed that she still has the right stuff. Runner-up went to KAL-KAM’S GO GIRL owned by Kelley & Tammy Hansen of Bothell, WA and handled by Daniel Burjan. Suzie won this event in 2003 and impressed judges, Ned Myers and Mike Kindler this year. The Drawing was conducted at the Clubhouse on the eve of the trial, March 19. It was conducted by Dustin Ochs, Robert Tomczak, and Darlene Lundy. Each of the three stakes attracted 22 entries. The Sportsmen’s Association has done a tremendous job of managing these grounds. The grounds consist of three one-hour courses with varying terrain. Feed strips line the edges throughout the course, giving the dogs plenty of places to hunt. With the help of AFTCA’s Twentieth Century Fund these grounds are able to continue as one of the finest venues available to the general field trial public. Quail were released during the trial to augment those coveys already established. The National Vizsla Association has many hard working members. Robert Tomczak, Dustin Ochs, and Mike and Darlene Lundy worked hard in organizing this trial. Mike and Darlene Lundy were a big help to the club with their time and equipment. Their truck doubled as the dog wagon. Gordon Long and Stewart Schwartz handled the dog wagon duties. Persons assisting with bird planting, assisting with gates and marshalling were Eric Ebert, Robert Tomczak, Dustin Ochs, Barry Peterson, Jonathon Peck, and JP Jones to name a few. Joanne Covey & Patty Lindsey provided delicious meals throughout the week. Ray Cooper provided a barbeque dinner to all. Horses were provided by Will Langley and Ken of Bottom Creek Farms. They made sure everyone was satisfied with their horse. Our trial was attended by many professionals from all over our country and Canada. John Reid from Ontario, Daniel Burjan from New Jersey, Dan Long in from Ohio, Jim Searles traveling from California and Dan Marr of Kansas were in attendance. It takes a lot of support from sponsors and contributors to put on a quality event and we are fortunate to have just such support. Sonny and Verla Mortenson donated cash to the derby purse. Their support and dedication to this trial is much appreciated. Nestle-Purina contributed generously to this National Championship with Pro Plan Performance Dog Food awarded to the winners in each stake, along with financial assistance to help cover the costs of putting on a trial of this magnitude. Hats off to Nestle-Purina Pet Care! Tri-tronics, also a long time sponsor, donated a Pro 500 Collar that was awarded to the Open Champion and a Sport 80G2 Collar for the Amateur Champion. The contribution from Tri-tronics for these top quality collars is very much appreciated. In previous years, Gary Jagoda donated engraved leather saddle bags and gun scabbards to the winner and runner-up of the Derby Classic. With the passing of Gary two days after concluding our trial last year, the club was up in arms about who would take over this important tradition. Ray Cooper offered his assistance and purchased and donated the Christie's Enterprises engraved leather saddle bags & engraved leather gun scabbard which were awarded in this years Derby Classic. Many thanks is also given to all those individuals who made cash contributions to the trophy fund for this event. HAWKS PAPPOMATIC found his way back to the winners circle with his second consecutive National Amateur Championship. He did it in the first brace of the second day on course one. His day began with an excellent cast down the left side. At the first creek crossing he switched to the right hand side and scored at 10 where course one and three share an edge. He exhibited excellent style and manners. On the left side of the big field after crossing the road, Pappy was found standing. The handler found only feathers and a non productive was taken. Pappy continued to hunt smartly and was rewarded at 54 at the ditch in Melvin Bottoms with his brace mate Hunter backing. As the birds flushed, they flew back towards Hunter and he went with them, ending his day. Pappy handled the find with out a flinch. Pappy finished the hour with a strong forward race and hunted throughout the hour with intelligence. STRIDERS GENERATOR won this stake for handler/owner Robert Tomczak and Michel Berner of Wisconsin. 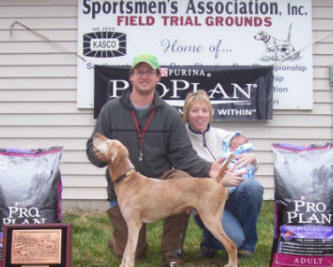 SAGINAW DIAMOND DAN placed second for handler/owner Mark Johnson of Illinois. Third in the derby classic went to KAL-CAM’S RUNNIN DOZER handled by Daniel Burjan for owner Brian Kennedy of Pennsylvania. Briggs won this classic by edging out his brace mate. Briggs appeared on course one in the six brace of the day. His race was big from the start. He displayed his hunting desire by running far and wide, always moving forward. He displayed enough of this to satisfy the judges for the victory over his brace mate Dan. Dan also ran a big race for owner Mark Johnson, but not quite as much as his brace mate, to earn him second place. Dan made large sweeping casts and held his edges well. Both dogs had the gallery watching every step of way and they delivered an excellent brace! Just 2 weeks ago these dogs competed in the Midwest Vizsla Futurity with Dan named Winner and Briggs Runner-up. Third place went to Dozer who ran a nice forward race, hitting the right objectives and required very little handling. If it were not for the one brace there were several other dogs that had good performances: Kidd, Penny, Jaks, and Tia to name a few. The judges for this stake were Ned Myers, Mt Vernon Iowa, and Mike Kindler, of Brownsville Wisconsin. They were impressed with the quality of the dogs in this stake. ONPOINTS TUFF STUFF won the National Championship with a great application and solid bird finding ability. This is the second time she was won this prestigious event; the first was in 2002. ONPOINTS TUFF STUFF performed on course one. She started the hour right away by hitting the edges. At 7 she politely backed her brace mate as they came to the end of the first field. At 15 she pointed in a hedgerow between course 1 and 3 with good style and manners. She rimmed the field after the double gates at struck again at 20. She again showed excellent manners. She entered the large field on a mission. Tuffy made a large move on the left side of the field and disappeared for a short time. She was found by her owner John Reid standing in the right corner of the large for her 3rd find at 27. Birds were flushed with all in perfect order. Tuffy made a nice cast down the left side after the course crossed the creek for the final time. She was rewarded with her 4th find across from the island. A dead bird was produced with all in order, and she was moved on. She finished the hour moving forward. Tuffy did an impressive job of grabbing and holding her edges. With this performance it gained her second National Championship. The runner-up, KAL-KAM’S GO GIRL, appeared on course two. She started out strong and forward. Suzie disappeared to the right before Sycamore Valley. As handler Daniel Burjan moved through the valley point was called by scout Carol Burjan. She was found standing at 14 on the right side half way up the hill in a patch of scrub oak. Birds were produced with Suzie exhibiting excellent style and manners. This was a high quality find. At 22 she struck again at the end of Sycamore Valley on the far left side just past the ditch. Again all was in order. Her 3rd find came at 59 behind camp. Again excellent style and manners were exhibited. During her hour Suzie was wide ranging, made some large moves, and finished strong garnering her Runner-up honors. She previously won this event in 2003. Judges for this stake were Mike Kindler of Brownsville, WI and Ned Myers from Mt. Vernon, IA. Standing: Kelley Hansen, Bill Linnig, Robert Tomczak (handler), Stella Lang, Jim Blumentritt, Ned Myers (judge), Greg Konan, Mike Kinler (judge), Mark Johnson (handler), Roy Pelton (Purina Rep), Daniel Burjan (handler), Kelley Hansen, Gordon and Tracy Long, Mr. Spacarelli, Mark Smith, Eric Ebert, and Bernadette Spacarelli.